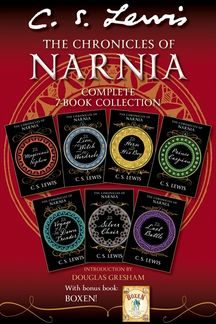 This collection contains all seven books in the classic fantasy series The Chronicles of Narnia without art, to appeal to older readers. This special ebook edition includes an introduction by C. S. Lewis's stepson, Douglas Gresham, and full text and art for Lewis's very first work—Boxen! Experience C. S. Lewis's The Chronicles of Narnia in its entirety—The Magician's Nephew; The Lion, the Witch and the Wardrobe; The Horse and His Boy; Prince Caspian; The Voyage of the Dawn Treader; The Silver Chair; and The Last Battle. This bundle comes with a special introduction by Douglas Gresham, C. S. Lewis's stepson, for a behind-the-scenes look at Lewis while he was writing the book. The Chronicles of Narnia has become part of the canon of classic literature, drawing readers of all ages into magical lands with unforgettable characters for over sixty years. Epic battles between good and evil, fantastic creatures, betrayals, heroic deeds, and friendships won and lost all come together in this unforgettable world. And then discover the world before Narnia with Boxen, a collection of stories written by C. S. Lewis and his brother when they were children, with the authors' own delightful illustrations. For every reader who has been captivated by the magic of Narnia, Boxen will open a window to another enchanted land and offer the first glimmer of C. S. Lewis's amazing creativity.